Byeong Hun An. Should've Took A Drop! In case we ever forget, Jean Van De Velde didn't actually try to hit his submerged that time at The Open. He looked at it a lot, but didn't hit it. Others that followed have tried. Some have succeeded many have failed. Like Byeong Hun An at Doral yesterday. This was messy. 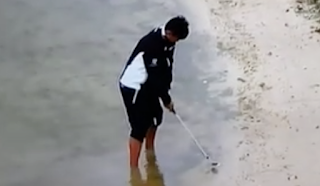 Byeong Hun An tried a Van de Velde today!